Would you believe me if I told you I did not like Oreos? 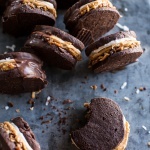 Probably not, considering I have made peanut butter dipped Oreos, chocolate dipped homemade peanut butter Oreo mocha ice cream sandwiches and more recently these peanut butter cup cookies and cream salted caramel popcorn bars. And I mean, that was all within the last ten months. You also probably wouldn’t believe me because, I mean who the heck does not like Oreos? Well me, but only sorta. When I say I don’t like Oreos, I really only mean the store-bought ones. But that’s only since I started making homemade Oreos. Store-bought Oreos? Sure they are good and actually they are really good in treats like these gooey chocolate Oreo crunch butter cake bars because they hold up a million times better when being stuffed INTO something and baked again, but when eating them alone? Sub par, they have nothing and I mean nothing on a homemade Oreo. Basically what I am saying is, I am a homemade baked goods brat. Just a straight up, spoiled rotten brat. Seriously, don’t try to feed me store-bought Oreos. Either hand me a bucket of peanut butter to dip those suckers in (YES!! Do this) or stuff them in something homemade and awesome. I was planning on waiting until closer to Thanksgiving to post these, but then I made them and just plain freaked out at their awesomeness. Ok fine, and their cuteness. Plus, they are kind of fun for Halloween. Orange and black? And since we are on the Halloween subject, you should know that it has been snowing here. Half the day yesterday and it is predicted to continue on all day today. I kind of love it. To me it screams cozy, snuggle in and bake cookies weather. The kind of weather that reminds me of when my mom and I (and probably a handful of brothers + friends) would bake chocolate chip cookies on a cold rainy October Cleveland day (swap the rain for snow here though, it never rains in October). Those were the best days, especially when those days fell on a Friday. Friday meant no school for two whole days. That was a big fat AWESOME in my brain. Making these is no harder than making any other cookies, they just require some time to chill in the fridge. If you can make cookies and do some stirring, you can make these. The pumpkin pie filling is actually true pumpkin pie filling. Oh yes, oh yes, it is incredible. Seriously, I could eat that stuff with a spoon. SO good. I made my own pumpkin purée by roasting a sugar pumpkin and puréeing it in my food processor. If you have time, do this!! It is a trillion times better and seriously so easy. Plus, so worth it. 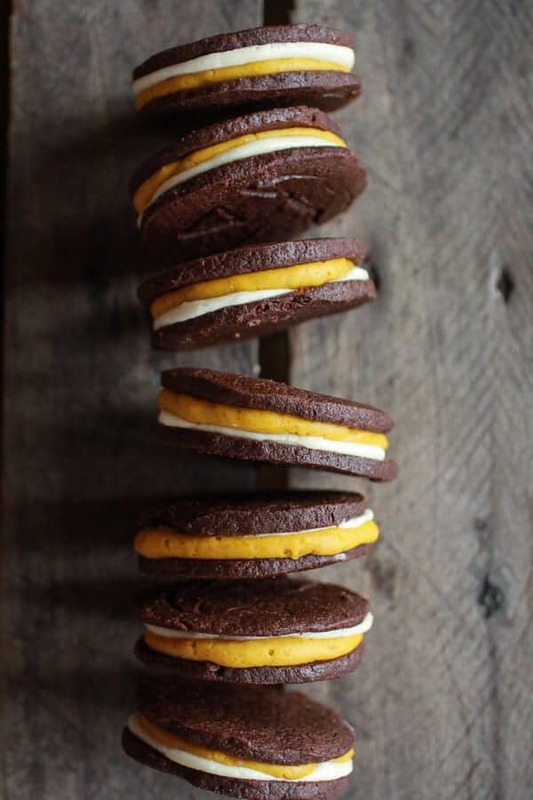 Oreo meets pumpkin pie and they make one heck of a cookie. I just really don’t even know what else to say. Just do it. Do it now. Make them over and over and over again until December twenty-fifth when you have decided you just can’t take anymore pumpkin. Does that happen? Oh and the best part about making your own Oreos? Making these delicious treats is no harder than making any other cookies, they just require some time to chill in the fridge. In a medium microwave safe bowl, place the butter and chocolate chips in microwave, stirring every 30 seconds until melted. Whisk in the sugar until well combined. Whisk in the vanilla and chocolate. 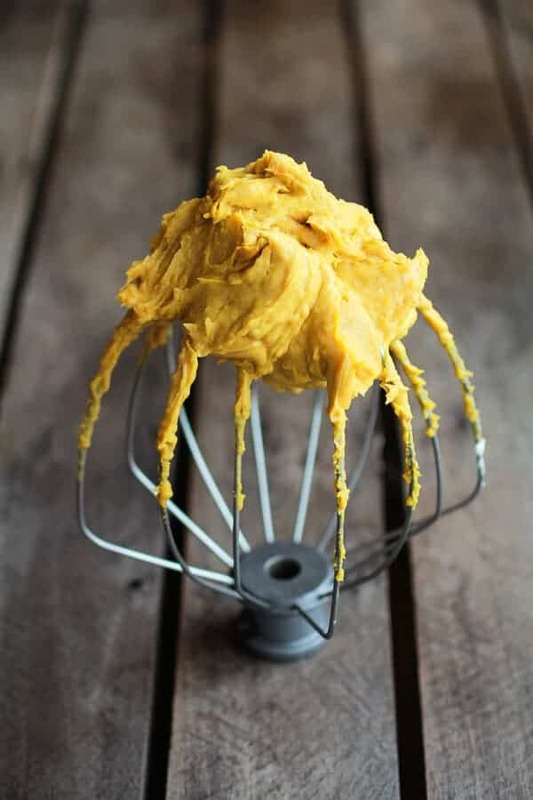 Whisk in the egg until combined. In another bowl, whisk flour, cocoa, salt and soda until combined. Stir flour mixture into the chocolate mixture. Beat with a mixer until the dough comes together as a solid. 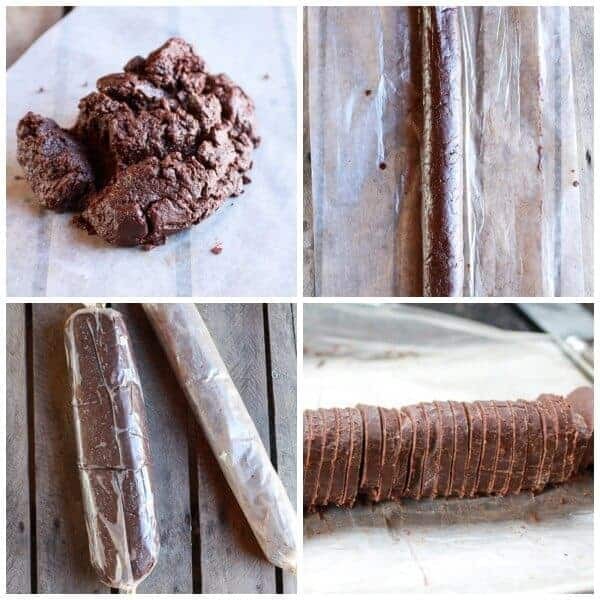 Transfer the dough to a sheet of wax paper. Shape into a log about 2 1/2 inches in diameter. Place log along the edge of wax paper and roll. Shape as you roll to maintain a smooth cylinder. Twist ends of paper to secure and help keep the shape compact. Refrigerate at least two hours or until firm. If log settles and flattens on one side, rotate every 15 minutes or so to maintain a round shape. Or you can transfer the dough to a sheet of wax paper. Shape into a log about inches 7 to 8 in diameter. Place log along the edge of wax paper and roll. Shape as you roll to maintain a smooth cylinder. Twist ends of paper to secure and help keep the shape compact. Refrigerate at least two hours or freeze one hour until firm. While the dough chills make the pumpkin pie filling. In a heavy saucepan combine gelatin, cinnamon, ginger, nutmeg, and salt. Stir in condensed milk and beaten eggs, mixing well. Let stand one minute, then place on burner over low heat, stirring constantly for about 10 minutes, or until gelatin dissolves and mixture thickens. Stir the the pumpkin and vanilla until completely smooth. Remove from heat and place in the fridge for one hour. Heat oven to 325 degrees and line baking sheet with parchment paper. Cut dough in quarter inch thick slices and place on prepared baking sheet. Bake for about 12-18 minutes or until cookies are firm to the touch. Just watch them because it’s hard to tell by looks if they are done especially since they are so dark to begin with. If your cookies are small circles, they will only need 12-15 minutes and if they are bigger circles they will need closer to 18-20 minutes. Cool and prepare the cream filling. In a mixer, beat the butter until smooth and creamy. Add sugar and vanilla and beat until smooth. Grab the pumpkin pie filling and place it in the bowl of a stand mixer or a large bowl. Beat the filling until smooth and whipped, about 2 minutes. To assemble the cookies, spread a little of the pumpkin pie filling on half of all the cookies, be generous with the filling. Now spread the cream filling on the remaining half of the cookies. 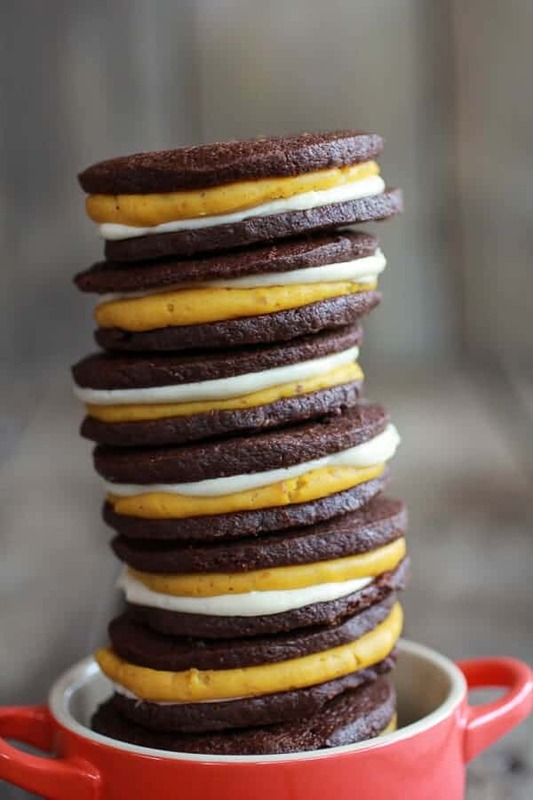 Sandwich the pumpkin pie cookies with the cream cookies. Now eat them!! You can not only double stuff, go ahead and live dangerously – triple stuff! These are making even a confirmed non-baker like me, want to bake! Haha! you have to try them!! 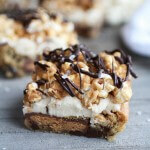 Oh my goodness, I want to make these right now! oh heck yes! 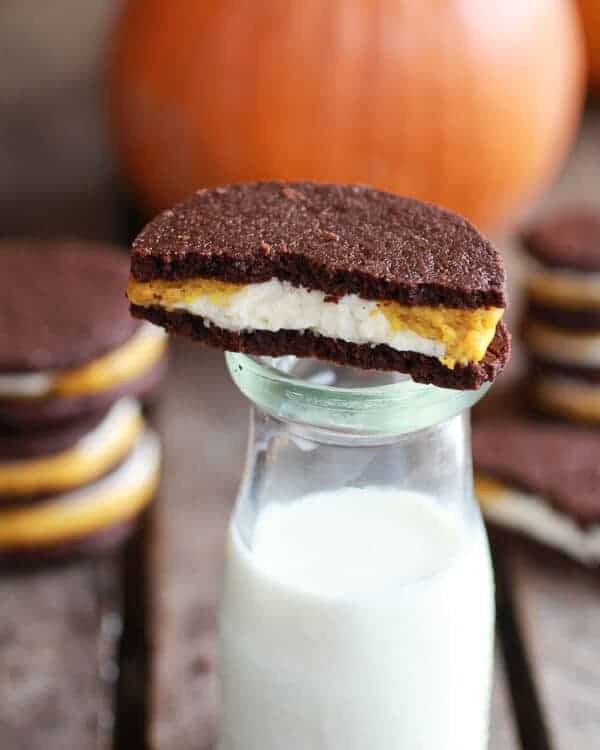 i love homemade oreos and the best part is that you put pumpkin in this!! perfect for halloween! Yowza! That is a serious cookie right there. I love the cool color combo. Thank you so much, Melanie! The color combo was my favorite too! Oh my! These look amazing!!! LOVE this recipe, Tieghan! Oreos are near and dear to my heart (read: serious addiction) and I cannot wait to try this recipe for Halloween or Thanksgiving! Thanks for sharing, girl. Pinning! Thank you so much, Stacey!! Hope you love these and thanks for pinning! You are so creative! Such a genius idea! I love that you added pumpkin! THANK YOU! It seriously means so much! Thanks Jaclyn! Have a great weekend! I REALLY LOVE that you’ve upgraded the oreo – so much better! Haha! Love that! Thanks Ali! These look so incredible! My mouth is watering! What a fun idea Tieghan – just in time for Halloween! Fun! 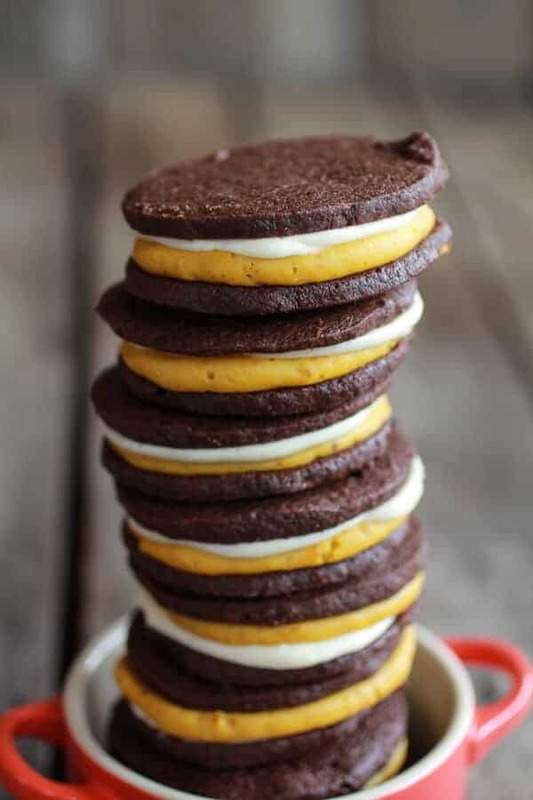 I posted a vegan/GF oreo recipe earlier this week, I wouldn’t have thought to pair oreos and pumpkin! You are very creative! Oh I will have to check those out! I already have too many of your recipes piled that I need to make. Can you just mail me a box of these, please? Haha! Thanks so much, Becki! If I had any left I totally would! So stinkin’ cute! I didn’t believe for a second that you didn’t like oreos. I do agree that the homemade ones taste so much better. I’m getting weak in the knees over these babies. 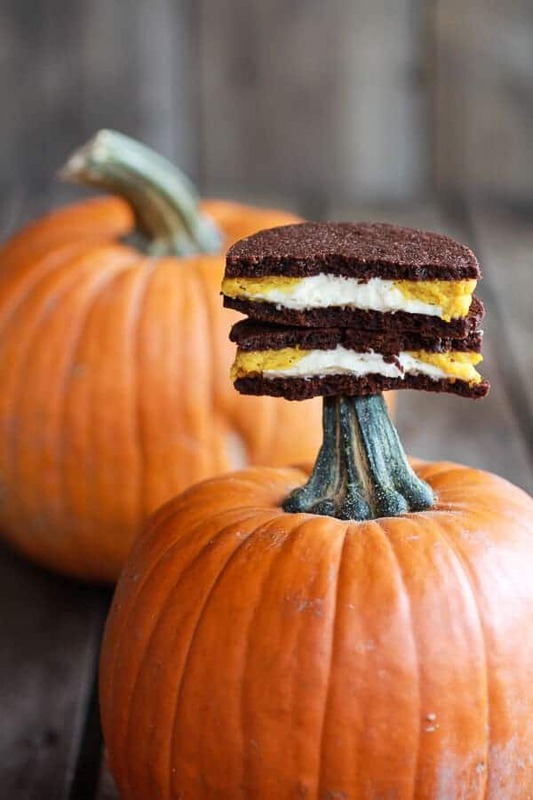 Give me all the pumpkin stuffed Oreos!! Ha! Thank you so much, Stephanie! Um, these look UNREAL! I have literally been pinning everything you are posting. Thanks for being so creative and inspiring! How cute are these oreo bites. Love the photos too! I’ve only made homemade oreos once and it was the regular kind. Evidently I am missing out! Thanks Erin! You have got to try these! Holy moly! I am in love with those!!! 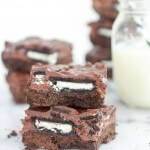 I actually LOVE oreos but have yet to find a homemade version that blows me away. I’ll have to give these a go. 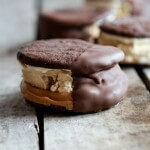 I love the homemade Oreos, but they are totally different from the store bought. Much softer and the fillings a different in some way. But If you like pumpkin pie you love these! Plus, they are pretty fun! Thanks Ashley! You’d think that since I love Oreos so much, I would’ve made homemade ones by now, but I haven’t. This might be the recipe to change that. 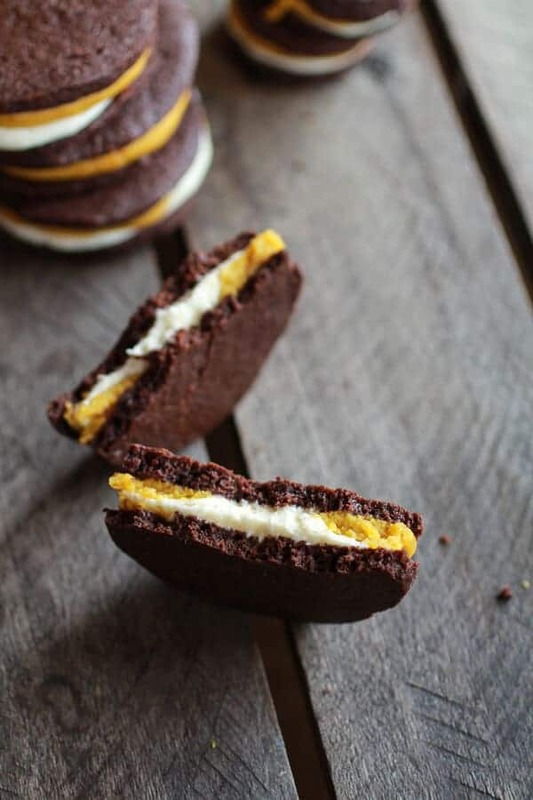 My favorite cookie stuffed with pumpkin? What could be better? Ya have to make some of your own. SO good!! Mouth watering photos! Looks delicious! Once again, your creativity is mindblowing! Pinned! And I agree with you – I think Oreos are way better suited to working INTO recipes than just eaten alone. I mean, for a crust, baked into bars, etc. they’re great. But why would you sit down to a storebought tube when you can have…anything else OR these homemade ones. AMAZING! Thank you, thank you, thank you!! For pining and for such nice comments every single day! You are always so supportive! Oh and glad we are on the same page about Oreos. I was worried I was going to offend some people (and I kind of did), but most agree! I am on the hunt for a homemade Oreo cookie recipe. I cannot wait to try this recipe. While I enjoy your lovely photos, I would appreciate more photos of the process. Especially rolling up in the wax paper and cutting. Do you use a knife or dental floss? Thanks! First thank you so much! I am happy you are excited about these!! Second, I actually have some shots of the process. I will add them to the post for you now. I kind of forgot that I took them. I make so much and photograph so much, that I forget about some of the photos! LOL! Oh and either dental floss or a knife will work great. I used a sharp knife though. Thanks so much and I hope the photos help! Thank you so much, Allison!! These are so pretty looking! 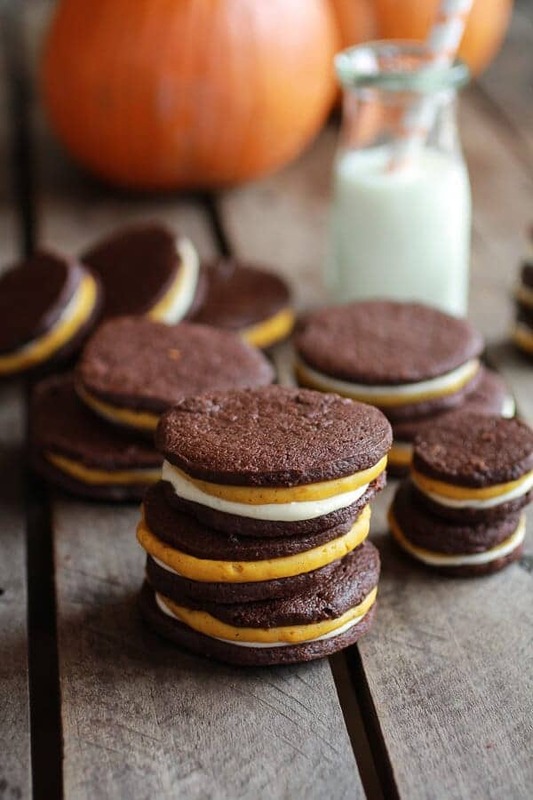 Yay, for pumpkin Oreos! YES! So happy to have gotten this posted in time for the Canadian Thanksgiving! I hoe you LOVE them! Oh and happy Thanksgiving! Ha! Thank you so much, Mimi! 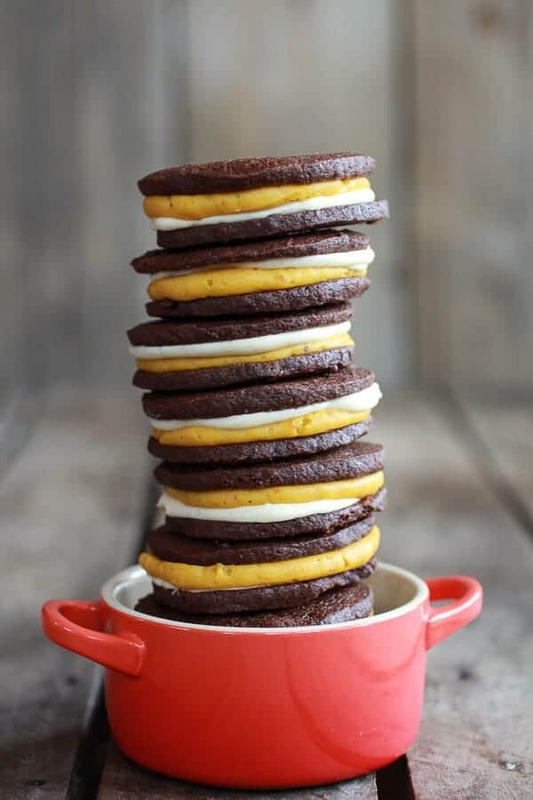 Oreos are my all time favorite…sorry, but I adore the store-bought ones haha When I was pregnant, I could demolish a package of double stuffed oreos dunked in a jar of peanut butter in about three days. (sometimes less!) oops! These look killer though! I definitely agree that homemade is fabulous! LOVE this combo!! Oreos in PB is the BEST thing ever. Love it! LOL! Chocolate and pumpkin is quickly becoming my favorite part of fall! Love these cookies!! 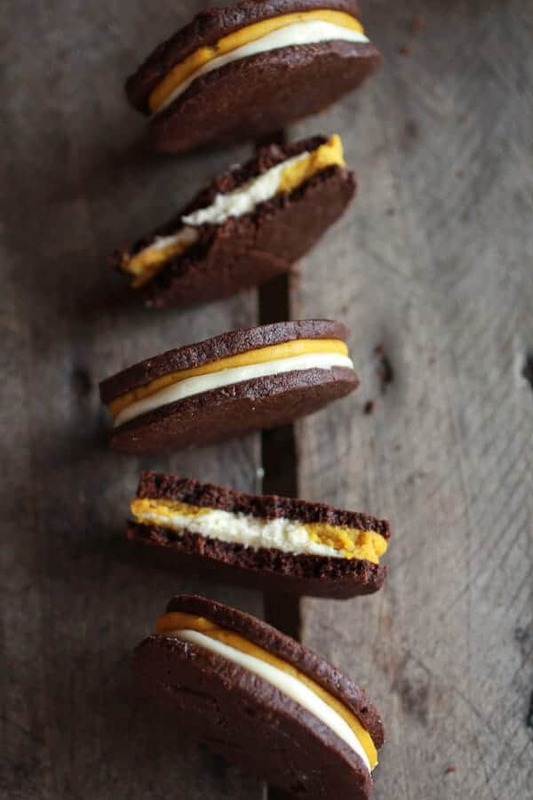 These look incredible, I love chocolate with pumpkin! Oh, and I’m totally a homemade baked goods brat too ;). So fun!! These are awesome! These are truly fabulous! You did it again! Tieghan, these are so well done. Yum!! THANK YOU for suggesting that one can use REAL freshly pureed pumpkin in stead of that junk in the can! I love pumpkin recipes but I cringe when I see the words “can of” in any recipe. Ha! I kind of agree! Thanks so much, Heather! These are simply adorable and very inventive. A great treat. Thank you! They are really fun! O-M-G!!!! Straight up AMAZING! I need to try these when I have some time! Thanks so much, Sophia! Hope you get to give these a try! haha – my husband LOVES Oreos. Me – they are never my first choice. But I am with you – it totally changes when they are homemade!! Love these! Oh I hope you love them! Thanks Allie! what a great idea! they look great. I want to cry from wanting these so bad. Ha! Wish I could send you some! So I made these tonight and the cookies were great, I tweaked the cream filling by adding more powdered sugar to my taste but I really struggled with the pumpkin filling. The first batch of it I made was way too runny and the second batch was better – thicker – but still not as thick as in your photos. The second batch was thicker I think because I used more heat but I’m wondering if the problem is because I used canned pumpkin? I even tried adding another can of pumpkin when it wasn’t really whipping and it helped a little but didn’t really resolve the problem. Any suggestions? Hey Megan, that is really strange. I do not think it is because you used canned pumpkin, but how long did you cook it for? Maybe you jut needed to let the mixture cook longer? Also, did you place the mixture in the fridge for at least an hour so it could thicken as it cools? You can also try adding the pumpkin before you remove the mixture from the stove and cooking it until it seems thicker. The gelatin should thicken the mixture right up. Kind of weird you are having problems. Let me know if any of this helps and if you have any more questions. Really sorry you are having problems, but I hope this helps! I know that this is SUPER long but I’m so exhausted from baking 1 million things today & these cookies really pissed me off which is totally my fault. So I’m sharing with you what I did wrong or whatever. #1) The recipe is written really poorly. I mean this in the nicest way possible, maybe it could just use a look-over & a few tweaks to make it better understandable to the reader/baker. For example, step 1 says to add the chocolate & then the egg. I didn’t know what that was even talking about because the “chocolate” part was step 2 (& yes I read the whole recipe 1st but I cant remember everything 😉 ). It was also confusing to me that the freezing parts were in one single step. If it was me, I would’ve had them in separate steps to avoid any mix-up. Maybe I’m just really stupid, I don’t know, but I just felt like the recipe could be organized better. #2) That damn cookie dough (Lol I’m frustrated): I could not (for the life of me) get this dough to be the right consistency. It was soooo crumbly. I had to substitute 1/4 stick of butter with margarine (the best kind), but I really do not think that is what caused this. Before I began to roll it out (still in mixing bowl), there was just the biggest puddle of oil at the bottom. When I picked up dough, it literally could’ve been dripping in oil. I know this sounds like something I did wrong, but I swear you guys I did it exactly the way I was directed (minus the margarine part). I feel like something was not absorbing the butter well enough (& yes I added the flour etc. correctly). Once I rolled it out is when it began to get crumbly & crackly. Now, I will say that where I live, the weather right now is so dry, like zero humidity, so I’m thinking that took a big part. Once it was all ready to cut, it completely crumbled as I cut into it. Luckily, ended up using a cookie roller w/ wet hands to roll it out & a cookie cutter to make the circles. So tedious, not what I was expecting to have to do the night before Thanksgiving. Anyways, I probably made them too thick because they were like rock hard to roll which runs into my last complaint that I will get to of them being too rich (they baked beautifully though, also easy to overcook if you’re a ditz like me 😉 ). #3) The pumpkin filling: Perfect flavor, but it was waaayyy too runny to turn into filling. I added an extra pack of gelatin* & put it in the freezer for a half an hour (could probably do 1 extra hour max). After that, it was SO perfect! There was SO much leftover though. Literally I could make a half of a pumpkin pie. #4) The cream filling: It was so heavenly (& simple)! Literally sent from the Gods. Just a little leftover, but not really because I ate it. #5) The final result: In the end, my cookies were too rich. I know that cutting the cookies out too thick had a huge part in it, but at the same time I made 20 cookies (technically 40) which is more than the recipe provided for, so I’m surprised. My cookies were a little hard too (I probably overcooked… 15 min is how long they were in). I’ve never thought of myself to be sensitive to richer desserts. So, I am keeping them in an airtight container in the fridge overnight, hoping that tomorrow the super-soft whipped filling with be a matchable consistency to the cookies. I really do appreciate this recipe though, even though I’m burnt I had a blast making these!! Sorry if I offended in any way, that’s definitely not what my intentions were. I use a lot of your recipes (repeatedly), and this is the very first one I’ve ever had a problem with. Thank you!!! I’m so glad I found your comment. This recipe is so poorly written, I don’t even know where to start. It would have been good to have gone through this and edited it before posting. I am really sorry you had trouble with this recipe. I just have a quick question before I try this recipe, the first paragraph you have written place the butter and chocolate chips in microwave, whisk in sugar, whisk in vanilla and again chocolate. I am not sure about the second time you mention chocolate in your first paragraph. Hope one of the recipes gets first prize, how fun!! THANKS!! 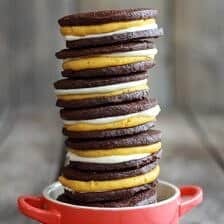 If you were making just the traditional homemade Oreo part, would you recommend using the same cream filling? These would be perfect for a fall themed baby shower I am hosting. 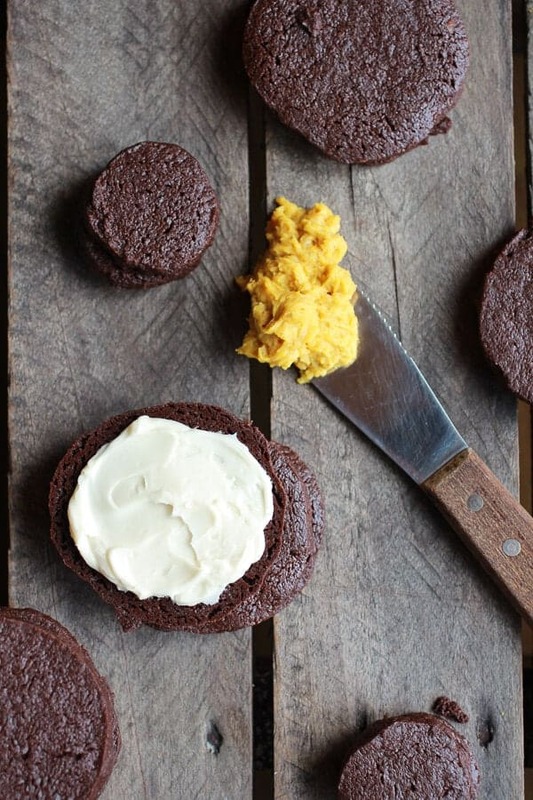 Could the chocolate cookies be made ahead of time and frozen? Hi Patti, yes the cookies can be made ahead and frozen, then thawed. It will work great! 🙂 Let me know if you have other questions. Enjoy! Thanks! Made the cookie part last weekend and they did freeze beautifully. Now a question about the pumpkin layer. I have a 1 oz box of gelatin with 4 packets of .25 oz each in it. Do I use all 4 packets?